Partial foot amputations may not offer a biomechanical advantage over transtibial amputations if the metatarsal heads cannot be retained, and some experts suggest amputation level should be selected based on probability of wound healing instead. But others disagree. “This is a population of people who are chronically unwell,” said study coauthor Michael Dillon, PhD, BPO(Hons), who is a senior lecturer at the National Centre for Prosthetics and Orthotics at La Trobe University in Melbourne, Australia. Dillon pointed out that surgical decisions are sometimes based on the assumption that more distal amputations entail functional benefits not available via, say, transtibial procedures. His research4 suggests that assumption is sometimes false. Clinicians seek practice guidelines that would bolster decisions about which procedures are best for which patients but, unfortunately, there isn’t yet a lot of quality evidence in the literature to support or refute disparate professional opinions. In a 2001 article in Orthotics and Prosthetics for the Foot and Ankle, clinicians outlined a number of orthotic and prosthetic approaches for different PFA procedures.2 For example, in patients with toe amputations, who are likely to retain some propulsive power, prostheses can augment propulsion and reduce pressure transfer to the metatarsal heads. Strategies may include soft inserts with custom toe fillers or inserts used in a shoe with a spring steel shank and a rocker sole. Compensating for ray resections depends, not surprisingly, on which ray is removed. For example, first-ray amputations transfer pressures to the remaining metatarsals and typically result in excessive pronation, so practitioners protect the medial column with multidensity prostheses and compensate for the loss of toe-off with either a rigid footplate or an exterior shank and rocker sole. More proximal amputations—e.g., Lisfranc (a tarsometatarsal disarticulation), Chopart (disarticulation through the talonavicular and calcaneocuboid joints), and Syme (in which the residuum ends at the distal base of the tibia)—require prostheses with longer toe plates, generally designed to maximize stability and help unload whatever residual foot may remain. Dillon and his colleagues used a dorsiflexion stop to limit tibial advancement, displacing load from the prosthetic forefoot to the anterior shell. The review Dillon mentioned16 was one of several papers published in a 2007 special issue of the Journal of Prosthetics and Orthotics (JPO) investigating the biomechanics of ambulation after partial foot amputation. Dillon et al found a high level of evidence that PFA generally affects temporospatial factors, ground reaction forces, ankle kinetics, and plantar pressures during gait. Comfort and cosmesis are too often overlooked by clinicians, according to Michael Pinzur, MD, a professor of orthopedic surgery and rehabilitation at Loyola University Medical Center in Maywood, IL. Traumatic amputations, for example, may be better suited for PFA than dysvascular amputations, because there will likely be fewer problems with circulation and infection. Pinzur pointed to a couple of his own PFA cases. In one, an el­derly woman could take only about six steps with her prosthesis, but was happy because that was all she needed to cook for herself and stay in her home instead of moving into a nursing home. In another case, a middle-aged tennis enthusiast was dissatisfied because, even though he could walk quickly and well, he couldn’t run, and he’d had to give up his favorite pastime. And several justifications often cited for PFA over higher amputations don’t appear to be supported by published evidence. First, as noted, a PFA that doesn’t preserve the metatarsal heads results in the same lost ankle power generation as a transtibial amputation. Second, as Dillon mentioned above, gait-related energy expenditure doesn’t appear any better after amputations proximal to the metatarsal heads than after transtibial procedures. Third, quality of life appears comparable in those with PFAs and transtibial amputations. Fourth, the lower mortality supposedly associated with PFAs is likely a result of selection bias. The authors concluded that a case could be made for choosing amputation level based on the probability of wound healing rather than based on any anticipated functional advantages, and that transtibial amputation might be preferable in many patients who are now given PFAs. Jeffrey Johnson, MD, professor of orthopedic surgery and chief of the Foot and Ankle Service at Barnes-Jewish Hospital at Washington University Medical Center in St. Louis, said he and his team generally get good results with transmetatarsal amputations as long as certain clinical considerations are observed. Johnson said that given the neuropathy and vascular insufficiency in many of these patients, continued ulceration isn’t surprising and shouldn’t necessarily be considered a treatment failure. “I don’t think it’s appropriate to just say to everyone with a forefoot ulcer, ‘Look, we can’t solve this problem unless we do a below-knee amputation.’ I would much rather do a transmetatarsal; it’s a smaller operation, it allows them to wear regular footwear, and it doesn’t present them with such a difficult decision,” he said. If transmetatarsal amputations fail or are inappropriate for a given patient, however, Johnson generally eschews more proximal choices and proceeds straight to a transtibial procedure. Johnson also noted that the options for reattaching the severed tendons in such cases aren’t ideal. Without reattachment, the residual foot will drift into equinus, load up the distal end, and become more vulnerable to ulcers, but these problems may occur even if the tendons are reattached. One consequence of the wars in Iraq and Afghanistan, Johnson noted, is that wounded veterans are showing they can function at a high level with transtibial amputations and advanced prostheses, and this is influencing those on the home front. Most of the surgical balancing Steinberg does is, in fact, for transmetatarsal amputations. “We commonly do an Achilles lengthening, but we are also doing more soft-tissue balancing at the ankle level—specifically, lengthening the tibialis anterior tendon—and that has helped balance the pressures in patients with a varus foot,” he said. Steinberg and his team haven’t enthusiastically embraced other lengthening procedures, such as those for the peroneals, but surgery, he emphasized, isn’t the sole determinant of success. At Steinberg’s clinic, patients follow up after surgery with a prosthetist-orthotist, and are then seen every month or two for the first year, to check for complications such as pressure lesions, contracture, or bony prominences. After that, follow-up visits for evaluation and preventive care occur every six months. “We never completely discharge those patients,” he said. Dennis Amtower, CPO, sees both sides of the argument. Amtower, director of prosthetics at NOPCO, a clinical division of Boston Brace, told LER that patient selection for surgical procedures is highly inconsistent, in his experience. Amtower emphasizes the importance of patient awareness regarding their clinical choices. “If they understand their condition and lack of sensation, and you can support them properly, they can function with a partial foot prosthesis,” he said. Amtower has, in fact, designed and licensed a filler prosthesis that integrates with a carbon composite AFO, which often works well for his patients. In contrast to Michael Pinzur, he also reports good results with clamshell designs. But as in surgical approaches, patient selection is critical. “If you’re working with a guy who smokes and drinks and goes walking in the snow without his shoes…” Amtower said, and let the conclusion speak for itself. Despite the findings in their recent paper, Dillon and Fatone are cognizant of broader issues. The PFA discussion is part of a larger story about decision making as disease-related amputations increase, Fatone added. 1. McKittrick LS, McKittrick JB, Risley TS. Transmetatarsal amputation for infection or gangrene in patients with diabetes mellitus. Ann Surg 1949;130(4):826-842. 2. Philbin TM, Leyes M, Sferra JJ, Donley BG. 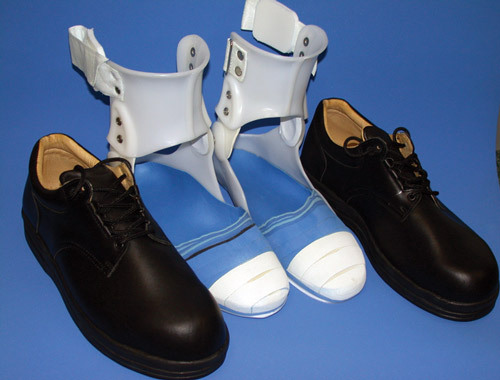 Orthotic and prosthetic devices in partial foot amputations. Foot Ankle Clin 2001;6(2):215-228. 3. Groner C. Selection of amputation level in diabetes patients. LER 2012;4(5):51-59. 4. Dillon MP, Fatone S. Deliberations about the functional benefits and complications of partial foot amputation: do we pay heed to the purported benefits at the expense of minimizing complications? Arch Phys Med Rehabil 2013;94(8):1429-1435. 5. Dillon MP. Partial foot amputation: evidence for device use. LER 2010;2(2):33-38. 6. Uellendahl JE, Uellendahl EN. Summary and conclusions from the Academy’s State of the Science Conference, on the biomechanics of ambulation after partial foot amputation. JPO 2007;19(3S):89-90. 7. Mueller MJ, Salsich GB, Bastian AJ. Differences in the gait characteristics of people with diabetes and transmetatarsal amputation compared with age-matched controls. Gait Posture 1998;7(3):200-206. 8. Janisse E, Janisse D. Partial foot amputation: pedorthic management. LER 2010;2(11):31-37. 9. Johannesson A, Larsson GU, Ramstrand N, et al. Incidence of lower-limb amputation and the diabetic and nondiabetic general population: a 10-year population-based cohort study of initial unilateral and contralateral amputations and reamputations. Diabetes Care 2009;32(2):275-280. 10. Miller N, Dardik H, Wolodiger F, et al. Transmetatarsal amputation: the role of adjunctive revascularization. J Vasc Surg 1991;13(5):705-711. 11. Peters EJ, Childs MR, Wunderlich RP, et al. Functional status of persons with diabetes-related lower-extremity amputations. Diabetes Care 2001;24(10):1799-1804. 12. Dillon MP, Barker TM. Comparison of gait of persons with partial foot amputations wearing prosthesis to matched control group: an observational study. J Rehabil Res Dev 2008;45(9):1317-1334. 13. Wilson E. Restoring center of pressure excursion in partial foot amputees using Toe Off style orthoses. Bundoora: La Trobe University, 2005. 14. Dillon MP, Barker TM. Can partial foot prostheses effectively restore foot length? Prosthet Orthot Int 2006;30(1):17-23. 15. Dillon MP, Fatone S, Hansen AH. 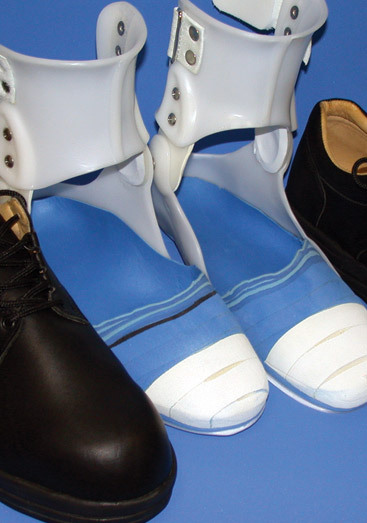 Effect of prosthetic design on center of pressure excursion in partial foot prostheses. J Rehab Res Dev 2011;48(2):161-178. 16. Dillon MP, Fatone S, Hodge MC. Biomechanics of ambulation after partial foot amputation: a systematic literature review. JPO 2007;19(3S):2-61. 17. Bowker JH. Partial foot amputations and disarticulation: surgical aspects. JPO 2007;19(3S):62. 18. Higgins TF, Klatt JB, Beals TC. Lower extremity assessment project (LEAP) – the best available evidence on limb-threatening lower-extremity trauma. Orthop Clin North Am 2010;41(2):233-239. 19. Pinzur MS. Outcomes-oriented amputation surgery. Plast Reconstr Surg 2011;127(Suppl 1):241S-247S.